Is EA officially distancing itself from the infamously philandering golfer? Looking at the big picture, this sort of thing is almost comical in a way: Almost exactly a year ago, EA Sports' Peter Moore said that EA would stand by Tiger Woods after the golfer's inability to keep his little 9-iron in his pants became a liability to his sponsors. The scandal wouldn't affect sales of Tiger Woods PGA Tour, said Moore. But then it did, and EA CEO John Riccitiello said that Tiger was only a good mascot as long as he was the best golfer in the world - not a golfer playing as poorly as he had been. 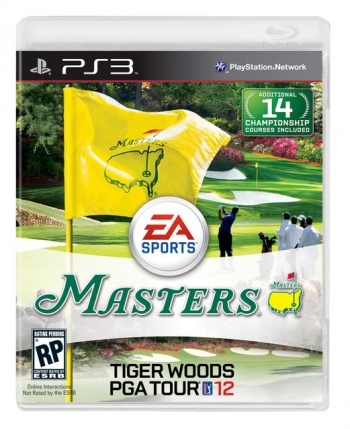 Today we got our first look at the box art for Tiger Woods PGA Tour 12, and guess who isn't on it? Rather, EA's focus this time around is on the Masters Tournament, one of golf's most storied events. "This year's iteration of the game is all about celebrating the Masters and the inclusion of the historic Augusta National Golf Course in the game," EA told Eurogamer, "[and] the box art is a direct reflection of that celebration. We want consumers to experience the rich history of the tournament and having one of the most iconic holes in golf (No 12 - Golden Bell) makes the cover art instantly recognizable to a broad spectrum of gamers and golf fans." Also, hole no. 12 - Golden Bell - was never involved in a public scandal of infidelity and intoxication. In all fairness, Tiger Woods could still be on the cover. I mean, there's a golfer there, right? He's just kind of small, and caught in shadow, and facing away from the camera - so it's kind of hard to tell who he is. It could be Tiger Woods, or it could be an athlete who hasn't embarrassed his corporate sponsors by whipping it out one too many times.